Bids for a total of 96 blocks of 15 minute each can be entered. Bidding session: 1000 hrs. - 1200 hrs. Single bids: 15-Minute bids for different price and quantity pairs can be entered through this type of order. Partial execution of the bids entered is possible. Block bids: Relational Block Bid for any 15-min block or series of 15-min blocks during the same day can be entered. Although no partial execution is possible i.e. either the entire order will be selected or rejected. 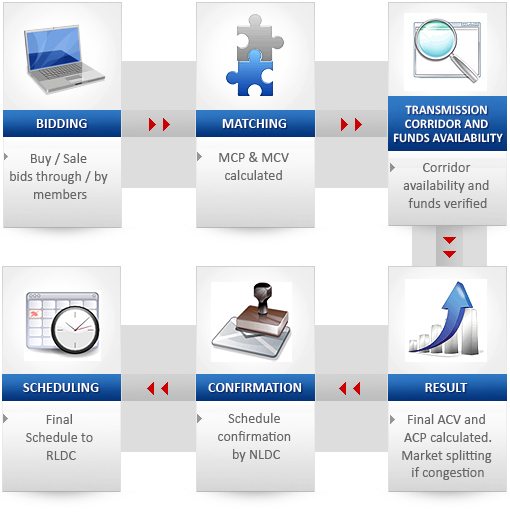 All purchase bids and sale offers are aggregated in the unconstrained scenario. The aggregate supply and demand curves are drawn on Price-Quantity axes. 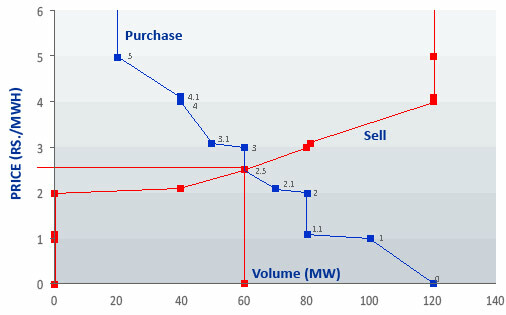 The intersection point of the two curves gives the market clearing price (MCP) and market clearing volume (MCV) corresponding to price and quantity of the intersection point. MCP and MCV are determined for each block of 15 minutes as a function of demand and supply which is common for the selected buyers and sellers. Selected members are intimated about their partially or fully executed bids and other trade related information. By 1300 hrs, transmission corridor required to fulfill successful transactions are sent to NLDC. The algorithm will then add the entire purchase quantum and sell quantum after the bidding session and look for a solution where the net transaction is zero i.e. the buy quantum is equal to the sell quantum. Preliminary MCP and MCV are used to calculate the provisional obligation of the selected participants and the provisional power flow. Funds available in the settlement accounts of the participants are verified based on the provisional obligation. In case of insufficient funds in the account, the bids entered by such a participant are deleted. Required corridor capacity and provisional power flow is sent to NLDC for scrutiny and corridor allocation is requisitioned based on availability. By 1400 Hrs, NLDC reverts with actual transmission corridor availability during all 15 minute time blocks across congestion prone bid areas. Based on the reserved transmission capacity intimated by NLDC, IEX recalculates MCP and MCV as well as area clearing price (ACP) and area clearing volume (ACV). See Market splitting for more info. ACP is used for the settlement of the contracts. On receipt of final results, obligations are sent to the Clearing Banks for Pay In from buying Members at 14.30 hrs and the bank is asked to confirm the same. Final results for confirmation and application for scheduling of collective transactions are sent to NLDC. NLDC sends the details of the schedule to respective SLDCs. RLDCs /SLDCs incorporate Collective Transactions in the Daily schedule. A scheduled transaction is considered deemed delivery. Deviations from schedules are dealt under UI or Deviation Settlement or Imbalance Settlement regulations. The Regional Entities (those connected at ISTS networks) are governed by CERC Regulations and Embedded Entities (those connected to state transmission or distribution network) are governed by respective State Commission’s regulations.